American Born Chinese graphic novel by Gene Luen Yang features a wild and crazy Monkey King. 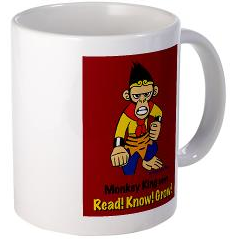 What a way to wake up with a jolt of java and Monkey King demanding you to Read! Know! Grow! He is such a cool king, and Gene generously donated this image in support of literacy and libraries. Thank you!